that culminates in FURST AID FOR THE HEART. GreytTherapy®/SM is our greyhounds only division of therapy dogs dedicated to the retired racing greyhound as therapy animals in memory of Greyhound Friends of NC Pet Therapy founder, greyhound rescuer, and our friend Pat Bleich and to honor our start up as GreytTherapy®/SM in Raleigh, NC. Looking for a very special Christmas Gift? Donate to Helping Paws International! Helping Paws International is a non-profit 5013-C organization. We rely solely on donations, so please review the list below of ways to donate to our organization. Every little bit helps! Should you like to make a direct donation, please go to the contact page and we will make sure to give you any information you might require. Thank you so very much! Shop for everyone on your gift list this holiday season at smile.amazon.com/ch/04-3614399 and Amazon donates to Helping Paws Of North Carolina Inc.
Our new web site is coming soon!! information on new and upcoming HPI events! 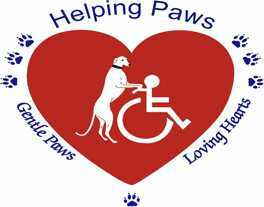 Helping Paws Internationaltm/sm is a non-profit, pet assisted therapy organization based in Raleigh, North Carolina. We are composed of members along with their therapy or assistance dogs. Our purpose is to assist healthcare as well as other facilities and individuals to improve the quality of life for patients and staff by providing therapeutic pet-human interaction. We believe there is no greater therapy than the love of a pet and the compassionate understanding of another human being. Helping Paws Internationaltm was started in September 2000 following a discussion among a few greyhound owners about pet therapy and what wonderful pet therapists our gentle, loving rescued greyhounds would make. While the majority of our current pet therapists are rescued racing greyhounds, we do accept all breeds of dogs, greater than one year in age into our program. We have a training program that culminates in the dogs receiving their AKC Canine Good Citizenship certification and their Helping Paws Therapy Dog certification. In addition, there are plans to add other types of pets to our program at a later date. Helping Paws Internationaltm/sm is a non-profit organization. We do not charge to visit a facility. Our funding comes from fundraisers, donations and corporate sponsors. The funds are used to provide insurance, training and supplies for our members and their pets such as small holiday surprises for the facilities we visit on a regular basis. Helping Paws was started in the spring of 2000 by a group of rescued-racing greyhound owners from the Raleigh, N. C. Optimist Park Playgroup following a discussion about pet therapy and what wonderful pet therapists our gentle, loving rescued greyhounds would make. After contacting Pat Bleich of Greyhound Friends Pet Therapy in Greensboro, NC, the necessary information was gathered on starting a pet assisted therapy program and in September 2000 we made our first therapy dog visit to Litchford Healthcare as GreytTherapySM. Our deepest appreciation goes to Pat Bleich for her help in getting our group started. As we grew we changed our name to Triangle GreytTherapySM Greyhounds and then to Helping Paws of North Carolina when our teams wanted to add their other dog breeds as pet therapists. We recently started doing business as Helping Paws International to reflect our teams in other states. In 2005 we started training assistance dogs by helping people train their family dog to assist a family member with certain daily tasks. Our assistance dog teams initially take the Helping Paws CGC-Therapy Dog certification program as their base training. Following completion of this this initial training, the assistance dog teams will have additional training focused on the skills needed by the handler. The assistance dog training is based on the availability of our trainers. Click on above logo for BARKS information! Helping Paws Internationaltm/sm also offers a canine reading assistance program to local schools, libraries, and adults needing to learn to read and speak again. The program, called B.A.R.K.S. © (Bonding, Animals, Reading, Kids, and Safety) is a therapy animal reading-assistance program to help children & adults develop a love for reading, over-come learning problems and build self-esteem. The program also teaches pet safety and care, along with interpersonal communication skills. If you are interested in joining Helping Paws Internationaltm/sm, having us visit your facility or just need more information, please check our contact page.